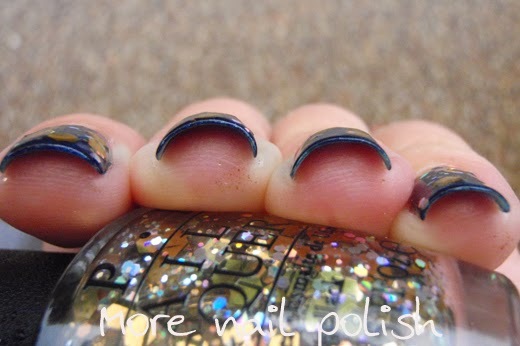 This is another post about OPI polish that I've been meaning to post for ages. 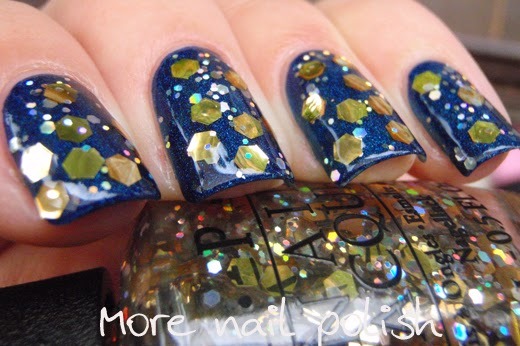 I remember reading on facebook, or maybe instagram, that someone's bottle of OPI When Monkey's Fly from last years Oz the Great and Powerful collection no longer had taco curling glitters. 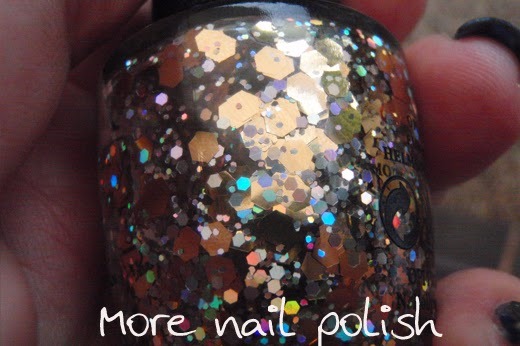 I finally remembered to check my bottle, and lo and behold, the glitters are now flat and gorgeous. 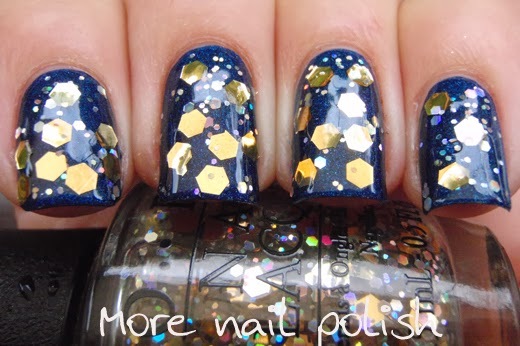 If you can't remember what they used to look like, check out my first review of this polish. 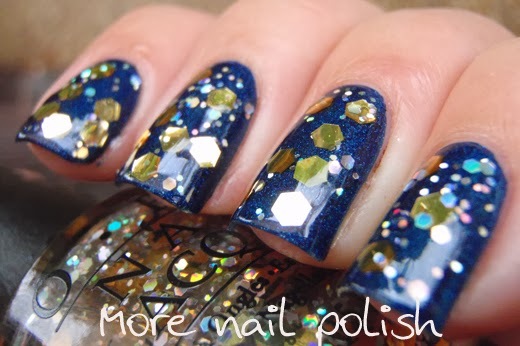 I stated back then that I loved the concept of this polish but was disappointed about the curling glitters, but just look at it now! These photos show one coat of OPI DS Fantasy topped with one dabbed coat of OPI When Monkey's Fly and one coat of Seche Vite. 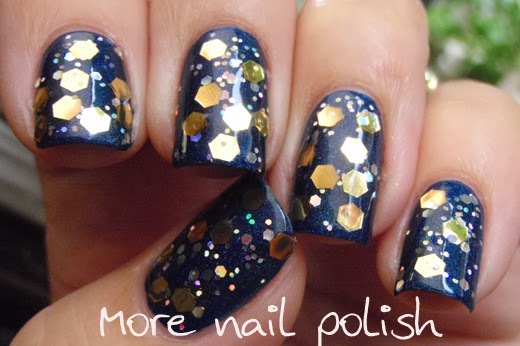 As you can see in the bottle above, all the glitters and totally flat! 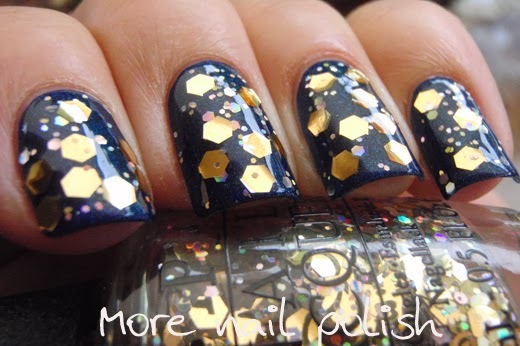 In addition, below is a really attractive nail shot to show that the big gold glitter site perfectly smooth now. This is with only one coat of top coat. To think of all the drama the curled glitters in this polish caused. All the people who wanted their money back, and the whole 'intentional curling' business. I wonder if the glitters turning flat again was the plan all along? Maybe the glitters started out curly? 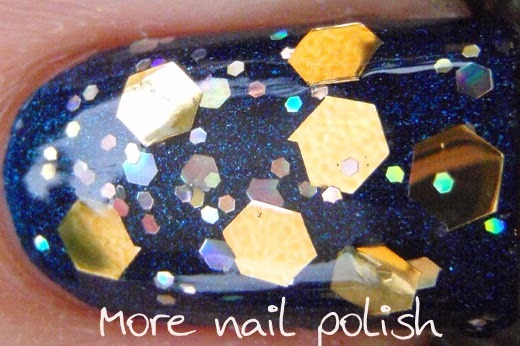 My bottle of Femme Fatale Eventide had curled large gold hexes when I bought it, but now they're flat as well. thanks for this post! I had just read it, then i happened to come across When Monkeys Fly at tjmaxx. bought a bottle, swatched it, NO curled glitter! Happy to have it as the collection came out right around the time when i got into polish and i passed on it then. Wow, I would like to know the scientific explanation for this.